This is chapter three in a series on Cortex’s development from a fledgling nonprofit to nationally known innovation district. Read from the beginning of the series here. By 2010, the Cortex Innovation District had 35 different companies working out of two different locations: the Cortex I building and what is now known as the DuPont building, after DuPoint fully acquired Solae in 2012. Still, the campus lacked necessary amenities to cultivate a true community: one-story third- and fourth-generation buildings surrounded the established Cortex buildings, orange gooseneck street lights lined the streets and there were few if any amenities nearby. To find any kind of food or retail stores, leaving the district was required. Adding jobs to the St. Louis economy by developing a centrally located business park had always been Cortex’s master plan. But as the newly hired president and CEO Dennis Lower knew, business parks weren’t exactly community builders. In a traditional business park, people tend to stay within their own buildings, rarely interacting with other people and companies. At the end of the day, the area empties out when workers head home. Cortex needed to be something different if it were going to truly transform the region. With this in mind, Lower and his board revisited the development plan and made the momentous decision to shift Cortex’s focus from building strictly a bioscience district to something more open ended: a mixed-use district. The first change was a symbolic one. On a tangible level, Cortex 2.0 spurred the renovation of what is now the @4240 Building. Opened in fall of 2014, @4240 is a $70-million showcase project that contributed more office space to the district. This phase also included the creation of the 3.5-acre Cortex Commons, a $12-million idyllic green space that opened in summer of 2015 outside @4240, and has become an ideal space for concerts, yoga classes or an outdoor lunch. Updated streetscape standards and new lighting fixtures rounded out the renovations. Perhaps most pivotal, Cortex’s 2.0 shift was also mission-oriented: Cortex opened itself up to startups and technology companies outside of the life sciences. 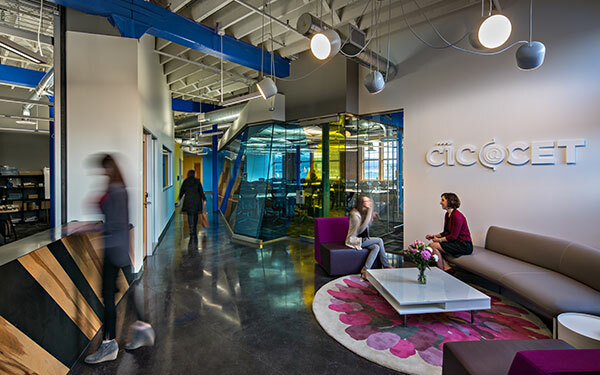 The Center for Emerging Technologies (CET): Founded in 1998 as the first Missouri innovation center, CET was adopted into the Cortex fold in 2012, with $5 million put towards renovating spaces for offices and co-working at the Sarah Avenue location. The new space opened in fall of 2015. The Cambridge Innovation Center (CIC), only the first outpost of the Massachusetts-based innovation center in the country, arrived in St. Louis in 2014. CIC manages some of the real estate within Cortex, hence the name of both the CIC@4240 and CIC@CET buildings. 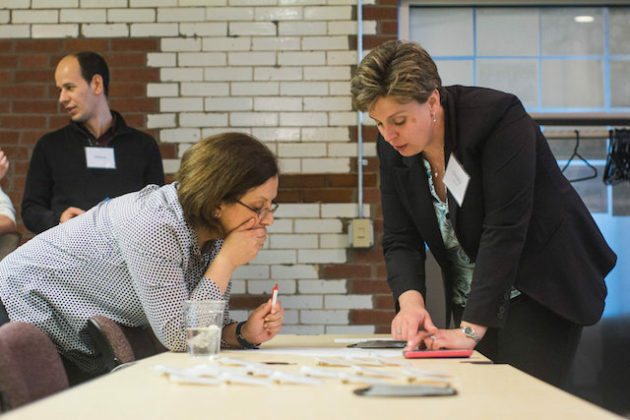 Venture Café, a nonprofit sister organization to CIC, came to St. Louis in the fall of 2014. First started in Boston—St. Louis was the second location nationally. Venture Café hosts a weekly networking event open to all and is what Lower calls the “elan vital” (lifeblood or pulse) of Cortex. 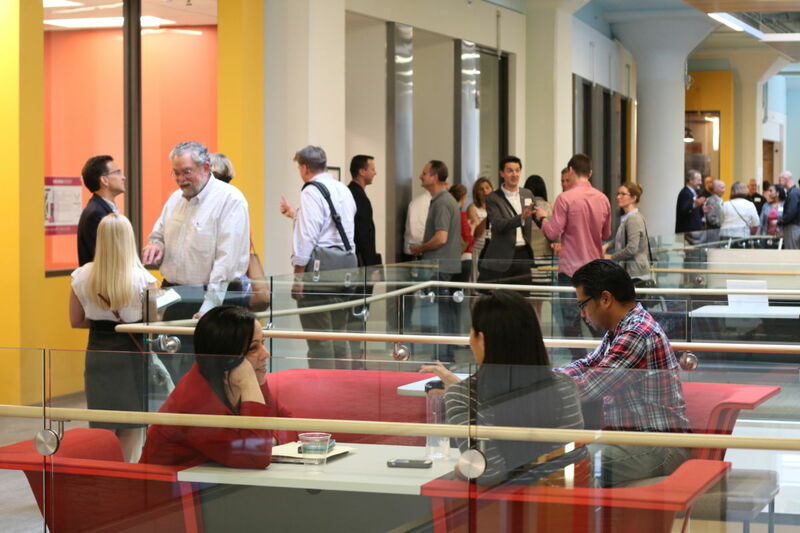 Sling Health, a WashU-born, nationally recognized nonprofit formerly known as IDEA Labs that works to solve medical problems, train innovators and improve healthcare, moved into CIC@4240 in 2014, then moved to CIC@CET in 2015. Med Launch, a nonprofit biomedical and entrepreneurship incubator out of SLU, arrived to CIC@CET in 2015. 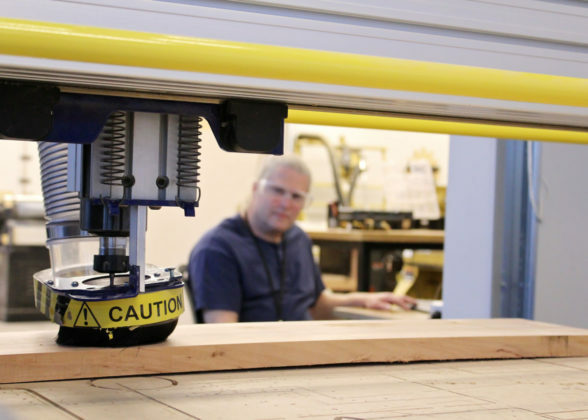 TechShop, a national maker space with nine other national locations (and three international) opened at the corner of Forest Park and Boyle Avenues in the late summer of 2016. 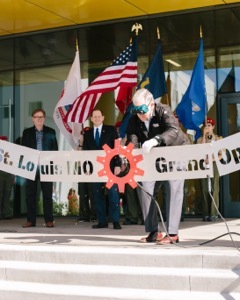 The TechShop St. Louis Grand Opening in 2016. Governor Jay Nixon uses a plasma cutter during the ribbon cutting ceremony. CIC@CET was renovated and re-opened in fall 2015. 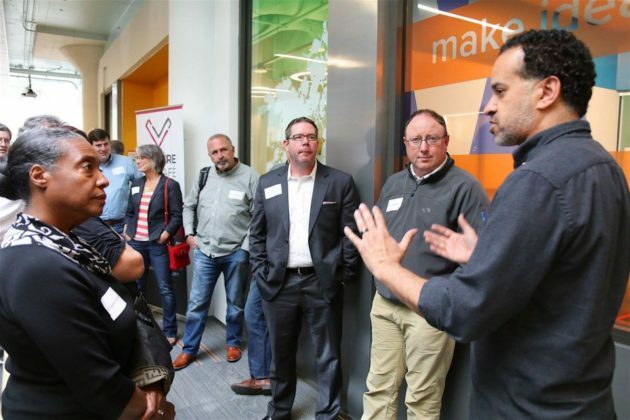 Travis Sheridan, Executive Director of Venture Cafe Global Institute, leads a visiting delegation on a tour during a Venture Cafe St. Louis event. | Photo courtesy of Venture Cafe. With the innovation centers came key resources, which manifested in satellite offices of service providers and banks, including Enterprise Bank, Husch Blackwell, Armstrong Teasdale, Bank of America, BDO and Rubin Brown, as well as programming and support organizations such as CET’s Square 1, Prosper Institute, House of Genius and Capital Innovators. 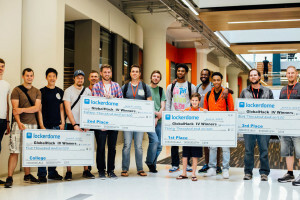 Events and hackathons like Globalhack and Startup Weekend St. Louis became more frequent, along with social events like weekly yoga and farmers markets in the Cortex Commons. 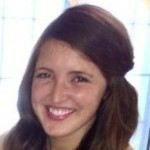 In this regard, Cortex has become a platform for the community’s programming. GlobalHack V took place in fall 2015 at @4240 in the Cortex Innovation Community. Filling Cortex with corporate tenants was never a key goal of Lower’s, but as the daily population of Cortex increased, with it came a new energy, which caught the attention of corporate entities in the region. 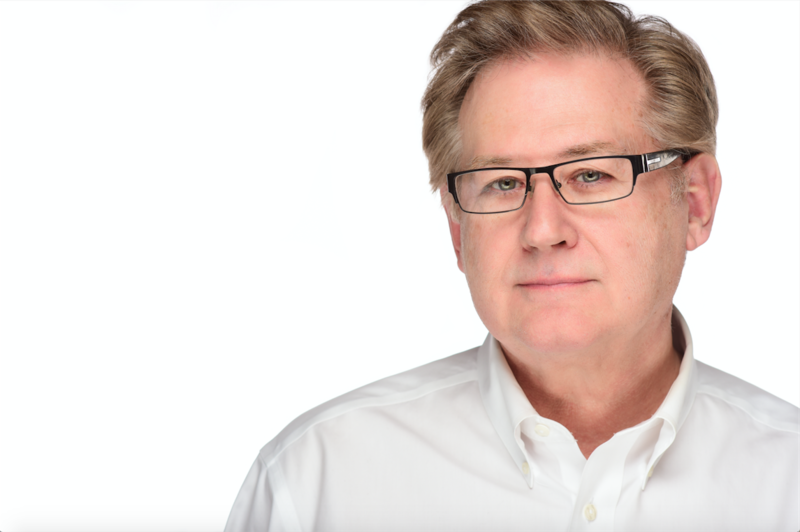 The last three years alone have seen companies like Nestle-Purina, Boeing, Maritz, Mastercard, Express Scripts, Uber and Pandora establish a presence—typically in the form of a satellite office—within the Cortex community. Lower sees this trend only increasing as companies look to get closer to entrepreneurial and technology-based thinking, attract talent spilling out of the universities that physically bookend the district (WashU and SLU) and have access to the technology or products they can either invest in, utilize as customers or possibly even acquire. In the summer of 2015, Cortex welcomed one such national company: Square, the digital payments company founded by St. Louis natives Jim McKelvey and Jack Dorsey. 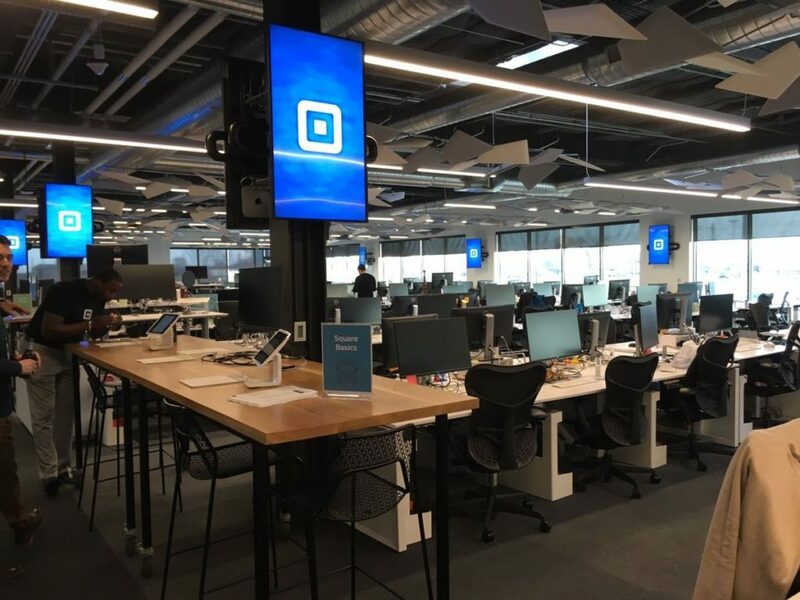 Square’s St. Louis office is particularly gratifying to McKelvey: despite his influential ties to the St. Louis startup scene (he also founded LaunchCode and the SixThirty accelerator), he chose to base Square’s operations in Silicon Valley in 2009 because at the time, St. Louis didn’t have the talent resources necessary to support sufficient growth. Another major win for the community was the securing of an IKEA within the district, opened in the fall of 2015. The first in the St. Louis region, Midtown’s IKEA brought an estimated 1 million shoppers to Cortex in the first year alone—visitors who might not have had a reason to visit Cortex before. Attracting this specific store was, like other curatorial moves Lower made, intentional. One year after the opening of IKEA, TechShop opened in summer of 2016 as another national feather in Cortex’s cap, offering a world-class makerspace not just for the St. Louis startup community, but for the region’s makers, craftspeople and students as well. 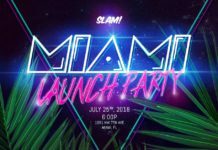 By the end of 2016, Cortex boasted more than 250 companies ranging from smaller startups to corporate offices and hosted countless service organizations and events. The story continues with Chapter 4 of 4 here.